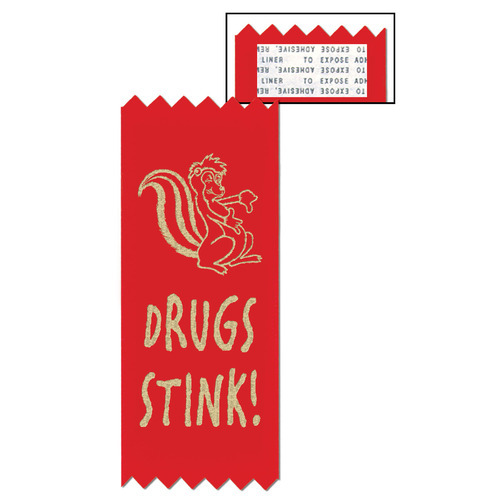 While Hodges Badge Company may be best known for equestrian, fair, and athletic awards, we want to let those of you working with children in schools and community programs know that we offer a full selection of red ribbons and drug free items for Red Ribbon Week. Each year, the last full week of October is designated as Red Ribbon Week, a national drug awareness event. By wearing a red ribbon, students and adults alike can show their stance on opposing drugs and drug use. Need a red ribbon? Check out our web site for 43 stock designs, as well as ribbons that can be personalized with your school or organization’s name, and 50 and 100-yard ribbon rolls. Also popular for Red Ribbon Week are drug free buttons and wristbands. Have you had an anti-drug campaign or drug awareness event at your school? What items or activities were a hit? Feel free to share in the comments. This entry was posted in Hodges Badge Company and tagged drug free wristbands, Drug-free ribbons, Hodges Badge Company, red ribbon week, red ribbons. Bookmark the permalink. Love the ribbons and this week. I’m amazed at how many students say no to drugs and now have a visual of a red ribbon as their mark of when they said no.